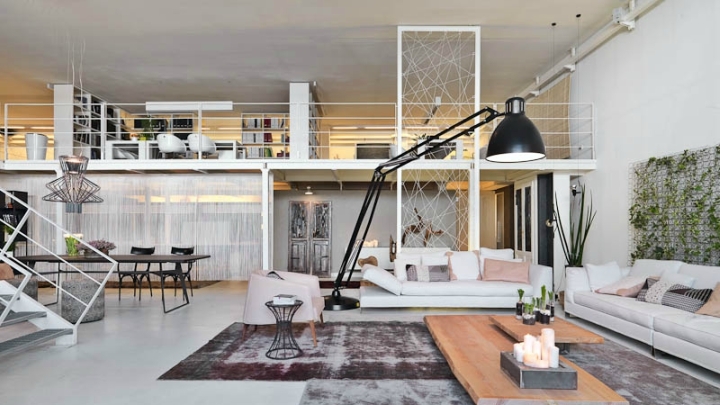 We’re going to Milan to meet this wonderful loft of two floors with an industrial style and personality, characterized by high ceilings and open spaces with strategically differentiated stays. The warm and cozy touch comes through furniture and textiles. An impressive home we discovered inside thanks to the images of Adriano Pecchio and whose characteristics we tell you then. Enjoy the ride! In the first level of this home find entertainment areas, restoration and relaxation with a large open dining room and a kitchen with an industrial inspiration. Through the use of white for the walls, floor and vaulted ceilings it is possible to enjoy a warm and bright atmosphere. A grand staircase leads to the second part of height separates the lounge kitchen area, differentiating these two places in a very decorative way. The kitchen of this loft is starring gray color and a large window that allows natural light. Countertop and industrial style furniture contrasts with a wooden bar that offers an interesting combination of textures in this room. 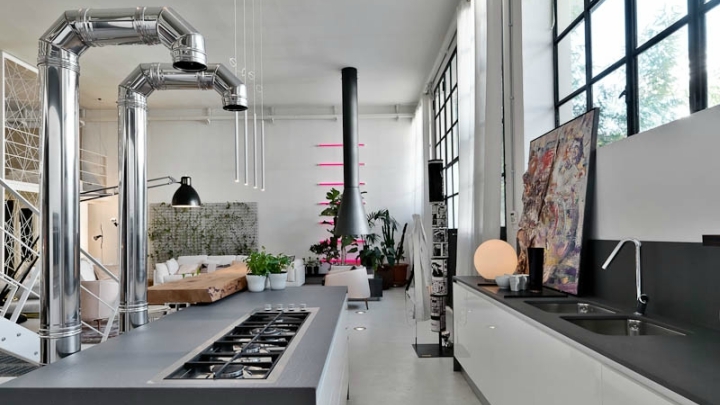 But if something catches our attention is the chimney hood, also very industrial and decorative tremendously. On the other side of the ladder we find the living room with sofas and carpets area relax, where we see an incredible fireplace whose exhaust leaves the roof and gives a unique touch to the decor, too much industry, like the lamp that looks like a giant flexo. Within this area, we enter a corner dedicated to rest with sofas chill and another fireplace to enjoy the warmth of the fire. The neutral tones used in this loft Italian make it possible that we are in a very comfortable, serene and welcoming atmosphere. White contrasts with gray, brown and black and make a home for those who, as I always say, want to be. With the use of these colors and textiles such as carpets and cushions are able to break the possible apparent coldness of the very high ceilings, so straight lines of spaces and industrial style. 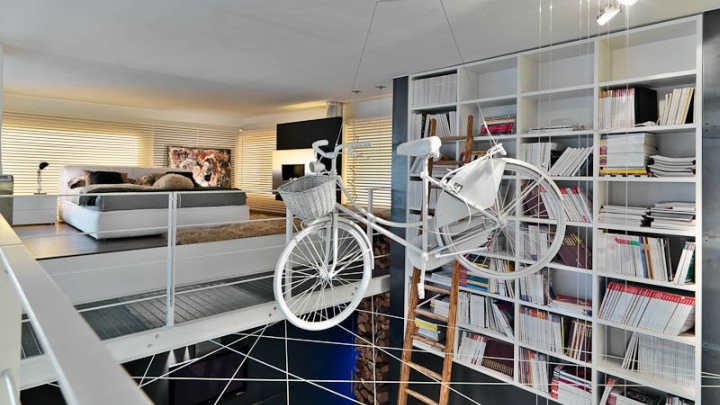 At the top we find the bedroom and work area, plus a library that can be reached from below with a beautiful wooden staircase, but I think rather fulfills a decorative function or storage of books not They use much because it has an overly convenient access … One of the most special parts of this loft is the white bicycle that is suspended from the ceiling, right next to this great shelf. Spectacular! By leveraging the full height of the housing to create this loft is achieved have large storage capacity and a house that has managed to capitalize on every corner, placing a bedroom and office on the top leveraging these high ceilings.